My boys started out with tote bags we had around the house while they waited for me to make some. Of course the bags served the purpose, but they weren't very boyish and were oversized. During a recent trip to JoAnn's, I let the boys pick out novelty prints for their bags. The 3-year-old chose Paw Patrol and the 5-year-old chose dinosaurs. I got a half yard of each, then came home and paired them with fat quarters of solid fabrics in their favorite colors. 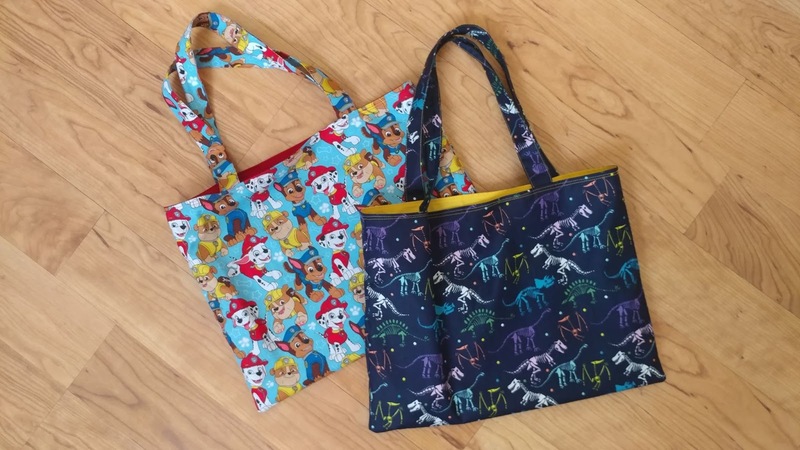 I also matched 50wt Aurifil thread to each bag: the yellow and dinosaurs got #2135 Yellow and the red with Paw Patrol got #2250 Red. I started with Amy Smart's tutorial here, but made a few changes. The first change I made was the size. The bags needed to be large enough to easily hold regular letter size papers. I decided it would be easier for the boys to put the papers into the bag if the bag was "landscape" instead of "portrait." 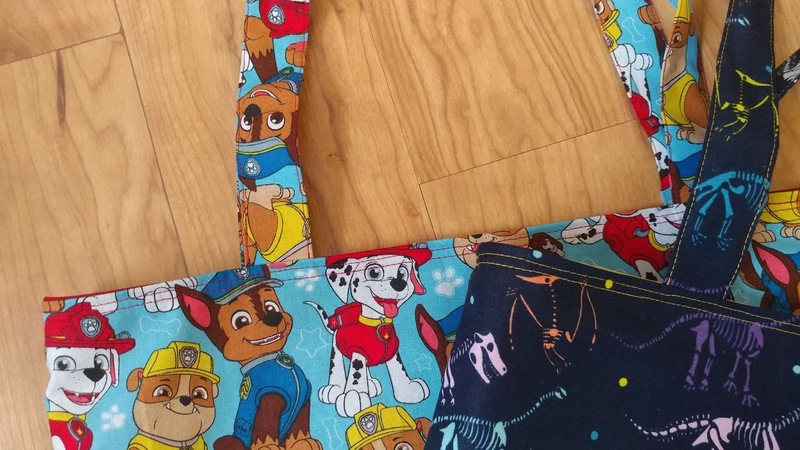 The next change I made was to use a "front" and "back" fabric piece for the outside of the bag instead of one piece. This was needed because my fabrics were directional. 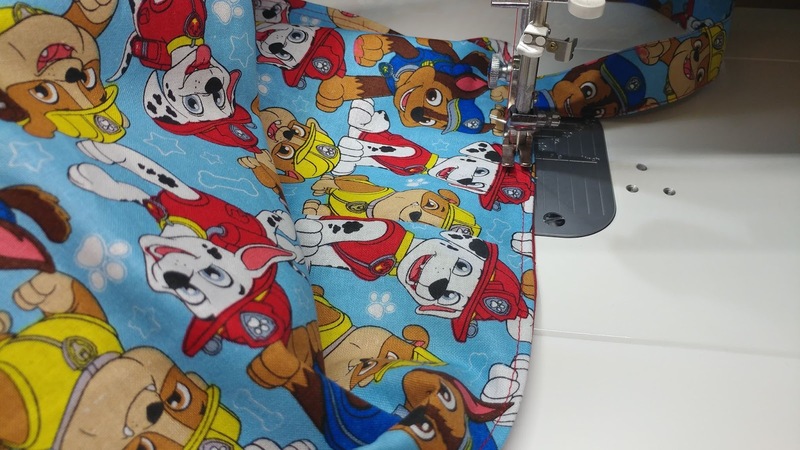 I cut two pieces, sewed them right sides together along the bottom edge, and pressed the seam open. Since my bags are wider than the ones in the tutorial, when adding the handles, I used 3 1/2" from the outside edge instead of 2 1/2". The final change I made to the tutorial was where the opening was left for turning the bag. 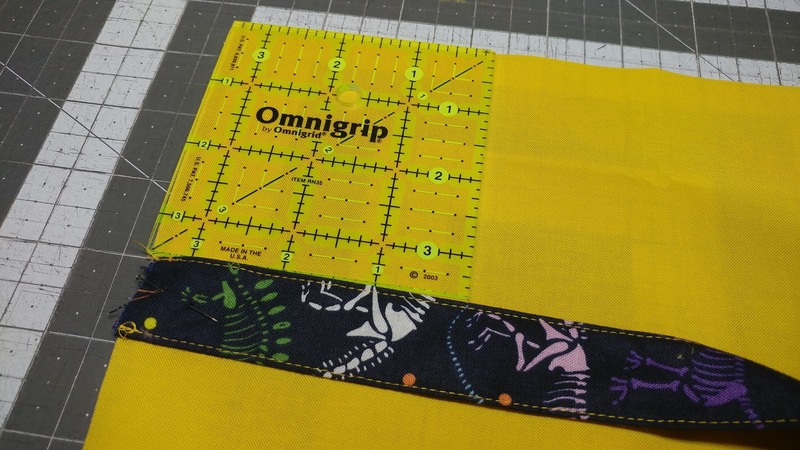 In the tutorial, it says to leave an opening in the side of the lining, so the topstitching is inside the bag. However, I left the opening between the handles on one side, so that the topstitching around the top of the bag would also close the opening. I'm normally quite apprehensive about any 3-D sewing, but small projects like this are really helping my confidence! I am actually pretty impressed with myself with these bags! The fact that I was able to make changes to the tutorial and the bags still turned out great is a testament that my skills are improving. I like to say, "I've leveled up!" 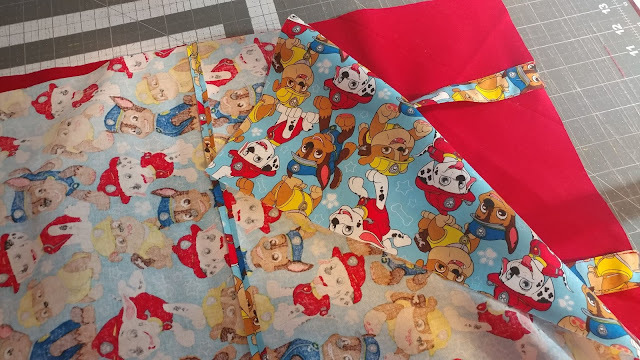 I have a few other 3-D sewing projects planned for next month (hello, Christmas!). Instead of my typical fear and procrastination for all things non-quilty sewing, I'm actually really looking forward to trying some new things! Let's hope they all go as smoothly as these bags! How about you? 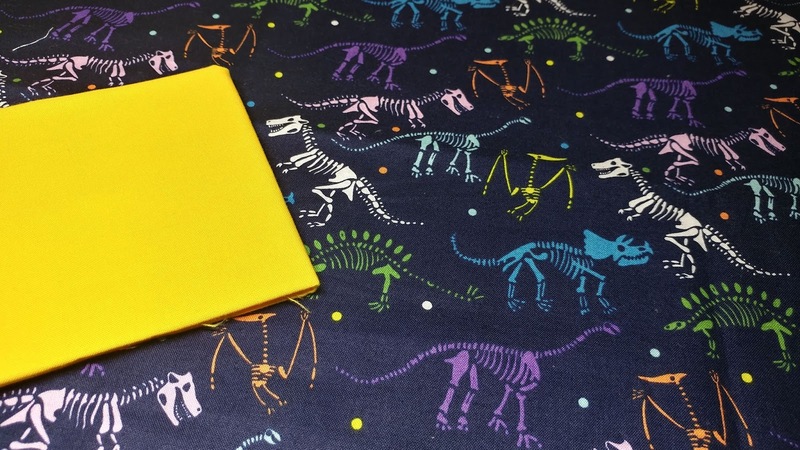 How do you feel about 3-D sewing? Do you have any planned for Christmas gifts? These turned out SO cute! 3-D sewing gives me a LOT of anxiety, so I avoid it whenever possible. The most non-quilting sewing I end up doing is fixing holes in clothes and only then when it is unavoidable. These are awesome, Laura, and I love how happy your boys look with them, too. Happy Thanksgiving! I'm with you on the 3-D sewing. The few things I've made have all been really simple. Your bags turned out fabulously. Your boys look absolutely thrilled. I also leave the opening between the handles to get caught in the top stitching. That makes so much more sense to me than having a noticeable seam in the lining. Fantastic bags. Those boys look so pleased. What a great job you did. I started sewing all my own clothes in 9th grade, but I don't consider it 3-D!! 3-D can be scary, but once a year I usually make something small that is 3-D. 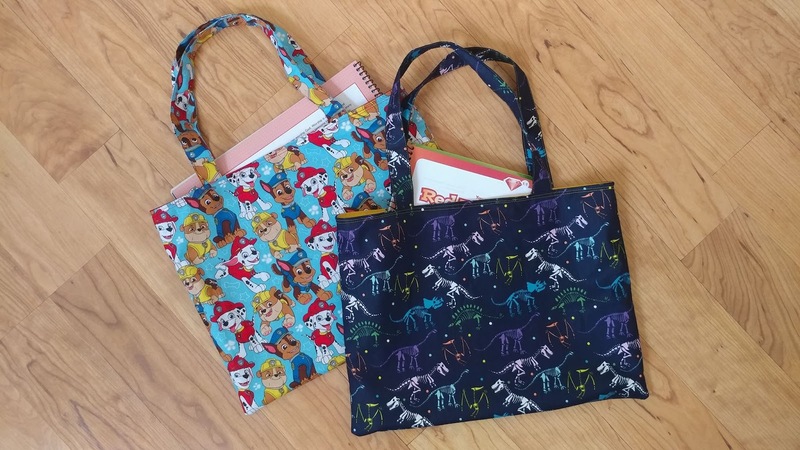 Your totes are fabulous!! Oh, Awana. That brings back so many memories! 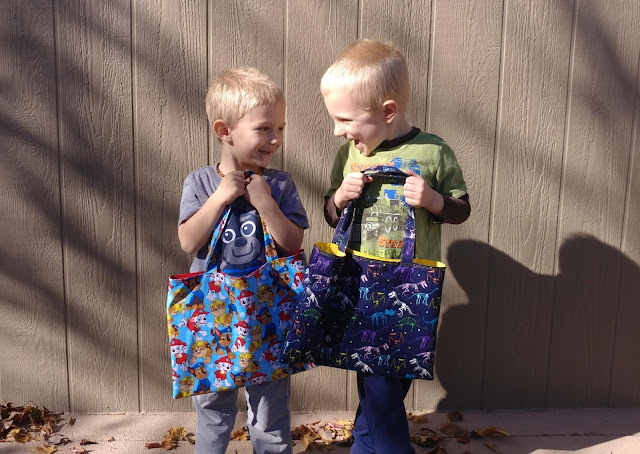 The bags are cute, but the smiles on your two little guys are priceless! Happy Thanksgiving! These bags are so cute! 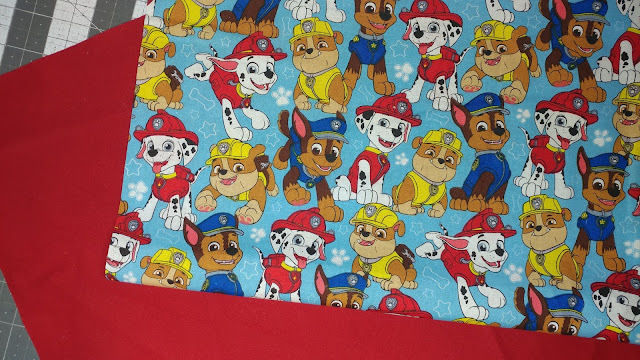 My 5-year-old is a big Paw Patrol fan, so that one caught my eye. Your boys look like they love their new bags! I do not enjoy 3d sewing at all. I avoid it whenever possible and I have pretty much given up making bags. Every few years I convince myself that I'm not as terrible at it as I remember and try to make something, then I'm miserable making it and it doesn't turn out right. I'm trying to break that cycle! 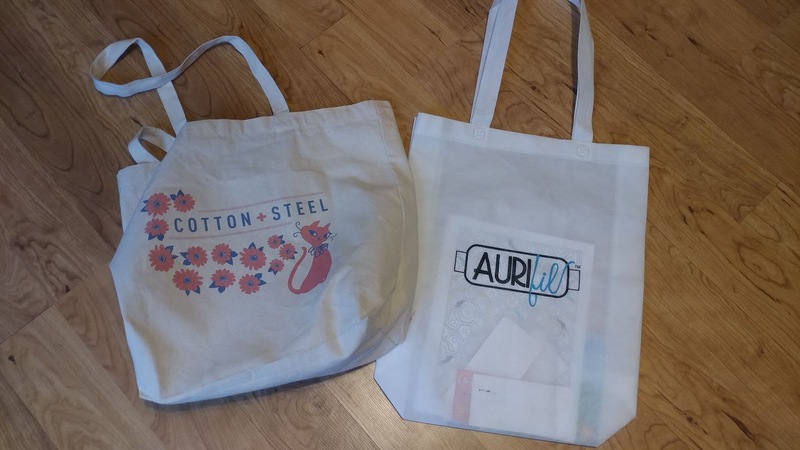 The bags look great! I do some 3D sewing, but some parts make me a little nervous (like getting clothes to actually fit, lol!). I'm pretty comfortable with bag, but only if I have a pattern to follow.